Exclusive from LankaHost, Weebly Site Bulder gives you drag and drop website builder makes it easy to create a powerful, professional website without any technical skills. Over 30 million entrepreneurs and small businesses have already used Weebly to build their online presence with a website, blog or store. First time in Sri Lanka, LankaHost is offering full Weebly product range with value added features through LankaHost partnership with Weebly. Remove "Powered by Weebly Footer"
What are the advantages of Ecommerce Hosting Packages ? Unlike static web site, e-commerce web sites are based on a CMS like OpenCart, Magento ect. It need high CPU and memory to load web sites efficiency. To get high power, you will need to look for a VPS or Dedicated Server. But running a dedicated or Virtual Server is very much expensive. Our Ecommerce hosting is resolution for above issue and we allocated considerable resources for Ecommerce hosting sites. Also we host very limited number of web sites per server. Therefor every site on the environment get high resource allocation. Can I run any other sites on this hosting ? You are only allowed to run e-commerce and business sites in this hosting. You should not host news web sites, image gallery or any other type web sites in this package, In the event we found we are abusing environment, we reserve rights to disable your hosting account. What is the IPG Account ? 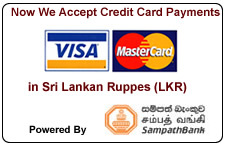 BizPay is First Sri Lankan multi-channel payment platform which enable VISA/MasterCard, Vishwa, ezCash, mCash payments in your web site with single merchant account. 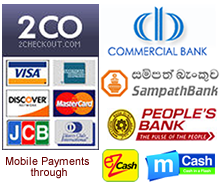 For LankaHost eCommerce Hosting Customers, BizPay Internet Payment Gateway merchant account can be obtain at a special discounted rates.